Ready to teach first grade history with the LIFEPAC unit worktexts—but don't need the teacher's guides? 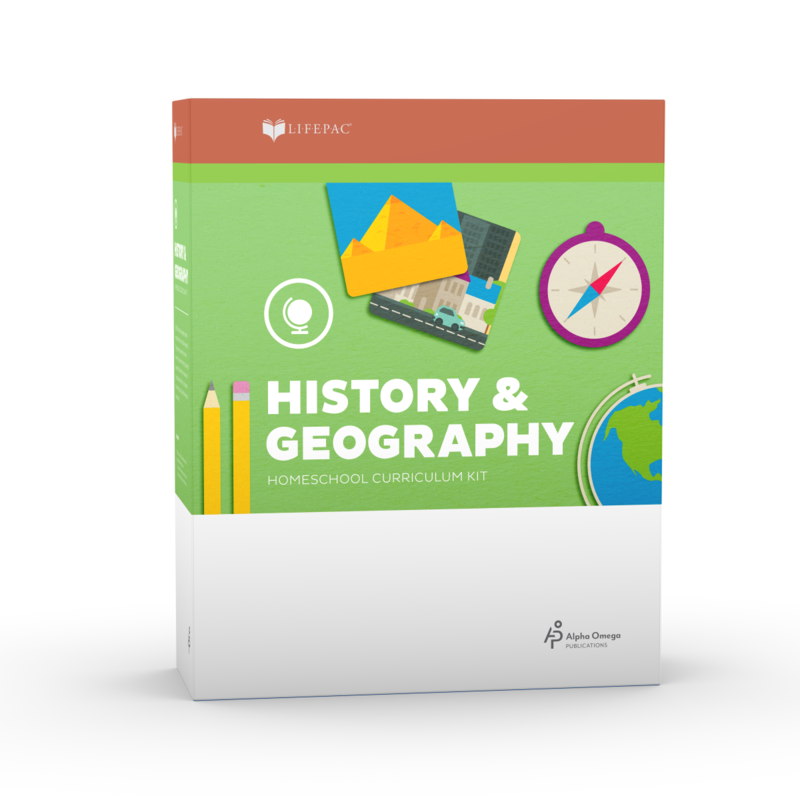 Then get the LIFEPAC 1st Grade History & Geography 10-Unit Set! These ten consumable worktexts include one full year of history lessons. Each worktext in this Alpha Omega curriculum has full-color lessons, self tests, and a removable teacher-administered test. Need a complete, step-by-step teacher's guide to help you teach first grade history? 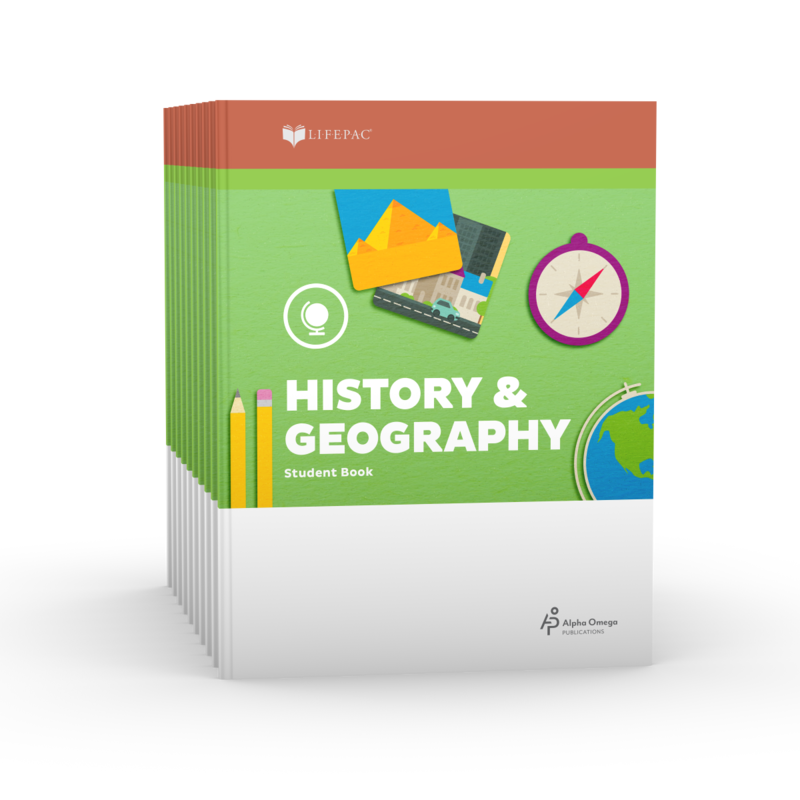 Try the LIFEPAC 1st Grade History & Geography Teacher's Guide Part 1! This easy-to-follow guide has an Alpha Omega curriculum overview, lesson planning, activities, worksheets, alternative tests, and more. Included are answers for lessons and tests in Units 1-5. Want a step-by-step teacher's guide to help you teach your first grader history? Try the LIFEPAC 1st Grade History & Geography Teacher's Guide Part 2! This step-by-step guide has an Alpha Omega curriculum overview, lesson planning, activities, alternate tests and worksheets, and more. Included are answers for lessons and tests in Units 6-10. 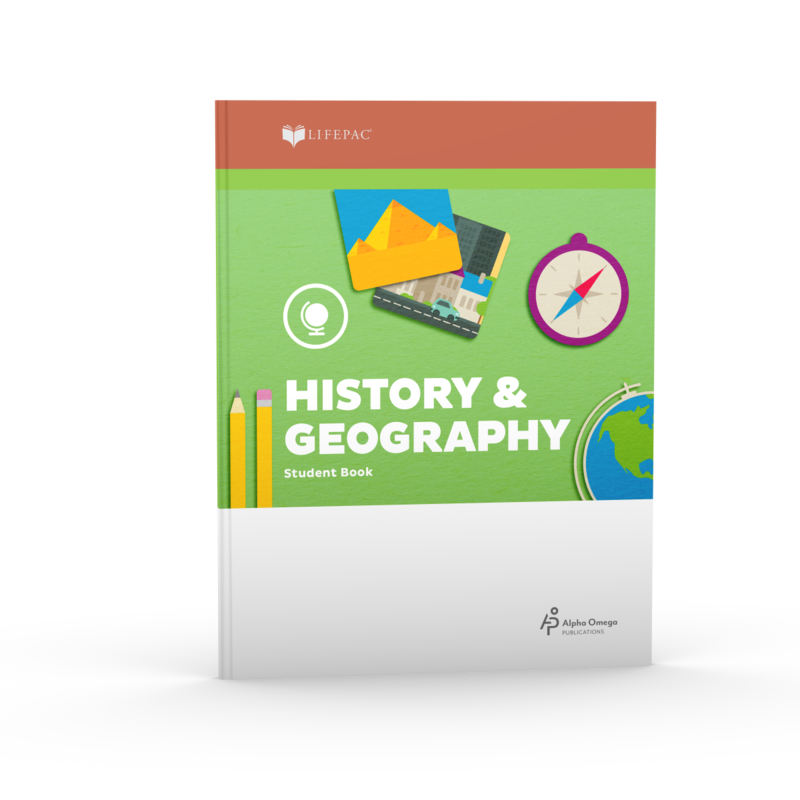 If it's time to teach your child history, then get the LIFEPAC 1st Grade History & Geography Unit 1 Worktext! This colorful, consumable booklet will help introduce your student to basic human principles. Topics in this Alpha Omega curriculum include God, family, and self, along with manners at home, school, and church. Three lessons and tests are included. Is your first grader ready to review fun-filled history lessons? Then get the LIFEPAC 1st Grade History & Geography Unit 10 Worktext! This bright, consumable Alpha Omega curriculum will help solidify lessons learned throughout the year. Three lessons review topics like communication, family, community, the world, and more. Tests are included. Want to teach communication to your first grader? Just get the LIFEPAC 1st Grade History & Geography Unit 2 Worktext! This full-color, consumable booklet will help introduce your student to fundamental communication techniques. Topics in this Alpha Omega curriculum include communicating with sound, silence, and with God. Three lessons and tests are included. Does your first grader know what feelings are? Using the LIFEPAC 1st Grade History & Geography Unit 3 Worktext, he will! This full-color, consumable booklet will help introduce your student to basic emotions and show how to respond to them. Topics in this Alpha Omega curriculum include feeling sad, happy, afraid, and more. Three lessons and tests are included. Teach your first grader about family members with the LIFEPAC 1st Grade History & Geography Unit 4 Worktext! This colorful, consumable booklet will help introduce your student to different family members and what families do together. Topics in this Alpha Omega curriculum include mothers, fathers, siblings, and more. Three lessons and tests are included. Want to teach your first grader about the various families he belongs to? Just use the LIFEPAC 1st Grade History & Geography Unit 5 Worktext! This bright, consumable booklet helps explain how your student belongs to a school family and God's family! Topics in this Alpha Omega curriculum include teachers, pastors, and more. Three lessons and tests are included. Teach your first grader about the different places people live with the LIFEPAC 1st Grade History & Geography Unit 6 Worktext! This colorful, consumable booklet will help explain different living places—like the city, the farm, and the sea. Topics in this Alpha Omega curriculum include home, work, and fun at these locations. Three lessons and tests are included. Does your first grader know about community members who help him? Using LIFEPAC 1st Grade History & Geography Unit 7 Worktext, he will! This colorful, consumable Alpha Omega curriculum will help introduce and explain people who help the community——like firemen, policemen, doctors, teachers, ministers, and more. Three lessons and tests are included. Does your first grader love his country? Teach him how with the LIFEPAC 1st Grade History & Geography Unit 8 Worktext! This colorful, consumable Alpha Omega curriculum will help explain how America was discovered, how the United States began, and how to show respect to the country. Three lessons and tests are included. Using the LIFEPAC 1st Grade History & Geography Unit 9 Worktext, your first grader will understand the world around him! This colorful, consumable booklet will help explain the different people and places in our world. Topics in this Alpha Omega curriculum include the globe, countries, and friends in Mexico and Japan. Three lessons and tests are included. Help your child learn U.S. history with the LIFEPAC 2nd Grade History & Geography Teacher's Guide. This guide offers a comprehensive curriculum overview, lesson objectives, extra activities, detailed teaching notes, and a complete answer key. Teach your second grader the basics of U.S. history with the LIFEPAC 2nd Grade History & Geography 10-Unit Set! These ten consumable worktexts provide lessons for an entire year. Each self-paced worktext includes full-color lessons, self tests, and a removable teacher-administered test. The teacher’s guide for this set is available separately. Begin your student’s study of U.S. history with the LIFEPAC 2nd Grade History & Geography Unit 1 Worktext. This colorful curriculum reviews concepts about living in families and explores God’s world after the Creation and the Flood. The course also covers the trail of the Native Americans and takes a look at the Norse settlers in North America. Give a child a comprehensive review of United States history and LIFEPAC 2nd Grade History & Geography with the LIFEPAC 2nd Grade History & Geography Unit 10 Worktext. This colorful unit covers all the material covered throughout the year from the colonists winning their independence to the country it is today with 50 states and a number of territories. The LIFEPAC 2nd Grade History & Geography Unit 2 Worktext captivates children as they learn about settling the New World. This colorful booklet covers key historical topics from a biblical viewpoint. Specially designed for young readers, this self-paced curriculum covers the first settlers, the colonies of the New World, and the War for Independence, as well as important symbols and historical places. Learn about history from a biblical perspective with the LIFEPAC 2nd Grade History & Geography Unit 3 Worktext! This colorful, curriculum looks at the forms of government in the Bible and those of other countries in the world. By studying these governments, students gain an idea for some of the building blocks that are needed to make a government successful. The unit also takes a brief look at how the U.S. government was formed and how parts of it work. Learn about the U.S. government as written in the Constitution in the LIFEPAC 2nd Grade History & Geography Unit 4 Worktext. This self-paced unit explores the legislative, executive, and judicial branches of our government, as well as the Bill of Rights and important symbols and historical places. A colorful curriculum, the LIFEPAC 2nd Grade History & Geography Unit 5 Worktext explores your government close to home. Lessons focus on the structure of state and local governments. Students also discuss their responsibilities as American citizens. Expand your child’s knowledge of U.S. history with the LIFEPAC 2nd Grade History & Geography Unit 6 Worktext from Alpha Omega Publications! This colorful unit tells the story of the westward movement and the courage, bravery, and adventure of the American people, including the famous Lewis and Clark expedition. Meet America’s pioneers in the LIFEPAC 2nd Grade History & Geography Unit 7 Worktext from Alpha Omega Publications! The seventh in a series of ten, this unit also studies how the present-day U.S. borders were formed.